Yotaro is fresh out prison and determined to turn his life around, and leave his gang member days in the past. To do this, he plans to study the art of rakugo, a traditional form of Japanese comedic storytelling, under one of the art’s great living masters, Yakumo Yurakutei VIII. Unfortunately for Yotaro, Yakumo has never taken on an apprentice, but this fact won’t keep Yotaro from trying. From Haruko Kumota comes Descending Stories, Vol. 1. Descending Stories is awash in the tensions that come with change. For Yotaro it’s his attempt to change his life, from one of a criminal to a practitioner of an art form he’s come to love. 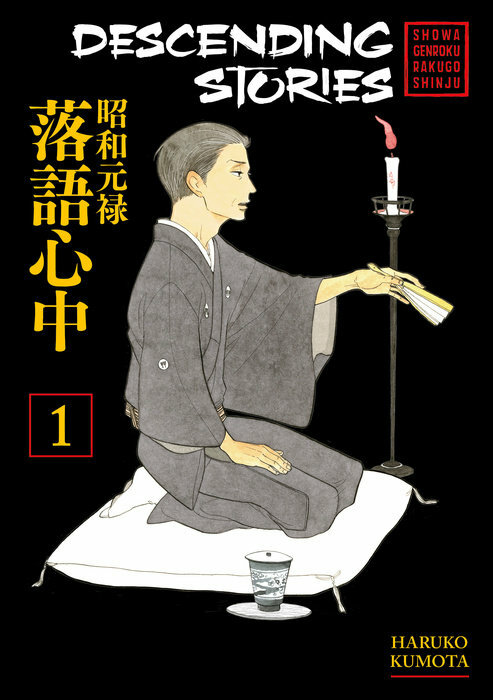 For Yakumo, it’s the change that’s taking place in society which sees the Japanese public drifting away from traditional forms of Japanese entertainment like rakugo in favor of more modern ones. For yet another character, Konatsu, it’s not so much change but her desire for change. As the orphaned daughter of one of Yakumo’s contemporaries, Konatsu has been his ward for a number of years, but the one thing she hasn’t been and won’t be is his apprentice due to rakugo being a traditionally male occupation. Deeply frustrated at her place in the world and her inability to follow her father’s footsteps, Konatsu stews in resentment and loss, unable to be where she wants to be due to tradition. Such things give Descending Stories the potential to be a fantastic and compelling series, but it has one major flaw: Yotaro. Despite his troubled past, Yotaro is a bland and forgettable figure throughout most of the volume. His personality can be summed up in two words, dumb and overly enthusiastic. These are traits which are probably intended to make him endearing, but they really just make him unlikeable and uninteresting. Instead, the most interesting character in the first volume is Konatsu. Her troubled relationship with Yakumo is engaging, and her struggle and desire to follow in the footsteps of her father is genuinely moving and frustrating at the same time. At one point, the cruel way in which Yakumo shoots down her ambitions made my teeth grind. Her struggle feels real and relatable, and I found myself far more invested in her struggle and story than anything Haruko Kumota was trying to do with Yotaro. His criminal past is the only thing that begins to lend him any sort of personality or characteristic beyond “annoying goofball,” but it rarely plays into things at this point and when it does come up it is too little, too late to make Yotaro an interesting figure. Note the body language and shadow placement in the third panel. Admittedly, one of the reasons for my fondness of Konatsu over Yotaru might have something to do with Haruko Kumota’s artwork. The visuals bounce between lovely, and forgettable. Anytime Yotaro is the focus of the page, his exaggerated reactions and mannerism detract from the emotional heft of the scene and the whole thing feels a bit cartoonish. His constant upbeat attitude, goofy grin, and overly emotive facial expressions make him come off like a cartoon character who has been crammed into a very different story. In contrast, Haruko Kumota’s styles seems to tighten up and become more detail focused during the scenes between Yakumo and Konatsu, and he does a particularly good job at conveying their emotions through their eyes. In one particular scene, Yakumo confronts Konatsu about her secret study of her father’s rakugo stories. He literally throws the book of stories in her face, and Kumota imbues Yakumo with an aloof, dismissiveness that is startling. Likewise, the need and hurt that Konatsu feels is clearly evident in the way Kumota renders her eyes. The result is a scene whose dialogue and visuals are crackling with an energy and tension that is lacking throughout most of the book. Another visual highlight comes during one of Yakima’s rakugo performances. In the story, Yakumo takes on the role of a woman, and Haruko Kumota renders the shadows and folds cast by his clothing in such a way that they take on the look and feel of the woman’s long hair tumbling over one of her shoulders. It was a subtle, clever, and did an amazing job at conveying how completely Yakumo vanishes into his performances. Due to the constant back and forth in both tone and visuals, Descending Stories, Vol. 1 ends up being a very uneven read. Yotaro is too bland and too uninteresting to really get behind. He feels less like the main character, and more like the comic relief sidekick. The combination of the unevenness of the book and the lack of a compelling main character makes for a rather awkward introduction to the story and its world. All in all, this was a less than inspiring first volume. Descending Stories, Vol. 1 is available now from Kodansha Comics. Review copy provided by the publisher.